“Pet” Monkey Spotted in Summerville!  For years, IPPL has fought the illegal pet trade that exists around the world. We have also written about the tragic lives these animals endure. 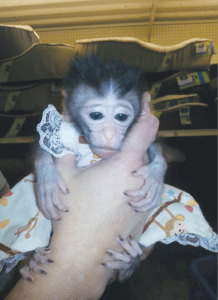 Even in this country, there are breeders/dealers who make a living producing babies only to take them away from their mothers and sell them to someone who wants, for example, a pet monkey. These infants are robbed of a life with their mothers, then sold to be raised as a “pet” or a “pretend” human child. The photo shown here was recently taken in a Summerville pet store and e-mailed to IPPL. The “owner” of the unfortunate animal claims to have purchased her from a dealer based in South Carolina for $600. The primate looks around two months old, maybe less. The painted nails and attire are quite disgusting, and the sad face is heartbreaking. Clearly this is not a happy baby. No wild animal should ever be bred to live like this and yet it is legal in most of this country. They are not taken care of properly and usually live in isolation away from other animals of their species, so they suffer physically and emotionally. One example is our own Spanky who appears on the back cover of this issue. Laws certainly need to be changed to prohibit all wild animals from being bred in captivity and then sold to anyone who has the money. And that includes lions, tigers and bears! We expect that our readers will agree. In the meantime, if you hear of anyone contemplating the purchase of any wild or exotic animal, perhaps you can persuade them that not only is it difficult to care for such an animal—it is cruel. We are concerned that PetSmart in Summerville allows customers to bring pet primates into its store. 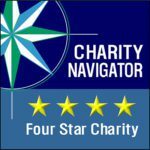 Please write a letter to the PetSmart corporate headquarters asking that the company not allow customers to bring exotic pets into their stores. It is stressful for animals to be brought into such stressful environments and they are exposed to humans carrying diseases and children who might tease them.